WILLEMSTAD - The Ocean Flower ferry which is now docked in the port of Willemstad will stay there for a while. There is disagreement between the Canadian owner and the Trinidad and Tobago government. 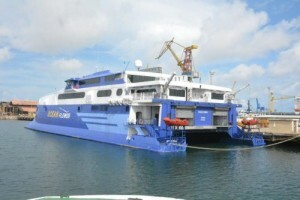 The ferry would sail between the Trinidad and the Tobago islands, but the government is busy with its own vessel and has prohibited the arrival of the Ocean ferry. It was already on its way from Panama and is now forced to stay in Willemstad.